The University of California San Diego (UCSD) has opened a new aerodrome for research into unmanned aerial vehicles. The outdoor facility is designed "to create a living laboratory for unmanned aerial vehicles by bringing together researchers from across campus, including computer scientists, structural, mechanical, aerospace, electrical and computer engineers and scientists at the Scripps Institution of Oceanography," according to a UCSD news release. Managed by the university's Contextual Robotics Institute, the aerodrome covers 2,500 square feet studded with motion capture devices and enclosed by a 30-foot-tall mesh cage, and will be used to further research on technologies as varied as drone swarms to hurricane-monitoring balloons. The university also plans to expand the facility next year, adding a 100-foot-tall indoor area connected to the current outdoor arena. "We expect to see new research results on control of swarms of small UAVs and on the coordination between humans and robots," said Henrik Christensen, a professor of computer science at the Jacobs School of Engineering and director of the Contextual Robotics Institute, in a prepared statement. "We will also test entirely new vehicles for long endurance flights." Falko Kuester, a professor in the Department of Structural Engineering and head of the DroneLab at the Qualcomm Institute, is leading a team that is exploring the use of drones in assessing damage after real and simulated natural disasters. "For example, they developed drone-based imaging techniques to map full-scale buildings before, during and after earthquakes and fires," according to a news release. "They subsequently tested these on the world's largest outdoor shake table here at UC San Diego. The drones acquired images and videos of a six-story building to document damage as a simulated earthquake and then a staged fire unfolded. Powerful algorithms then turned the data the drones collected into detailed three-dimensional models that researchers could literally walk through in a Holodeck-type environment to look for damage." Kuester's team travels around the world helping locals with data collection and reconnaissance after disasters and with the preservation of historical sites. "The ability to develop, test and refine drone-based imaging techniques is critical for our rapid response team," said Kuester in a statement. "Being able to develop and test indoor-outdoor flight transitions, under the broad range of scenarios that can be created within the aerodrome, is a game changer for us and will ultimately help with saving lives, following disasters." Jorge Cortes and Sonia Martinez, both professors in the Department of Mechanical and Aerospace Engineering, are working on algorithms to control swarms of robots and drones for a variety of potential uses, such as search and rescue, delivery and environmental monitoring. The team has developed tools that allow a single user to control a swarm, first using an interface on a tablet and soon through a motion-tracking bracelet that will translate gestures into commands for the devices. 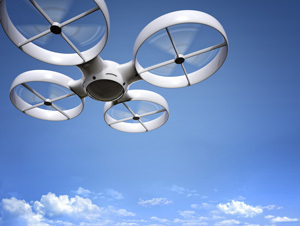 "There is today a shortage of engineers that have experience with drone technologies," Christensen said in a statement. "The aerodrome will allow us to fill that gap." Funding for the new facility was provided in part by Qualcomm and Northrop Grumman.